I was born in 1955, in Lewiston, Maine and have lived in Lisbon Falls with my husband Carl since 1977. We currently share our ranch with my second Morgan horse; "Rosie" and our adopted cat, which I jokingly call "Queen of Sheba". I am one of those true born horse lovers as I have been drawing horses ever since I can remember. As a child I would read every horse book in our school library and draw every horse picture I came across. "Black Beauty" is still my favorite childhood horse story, with the "Black Stallion" a close second. 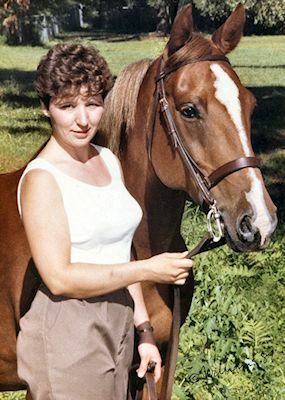 Here I am pictured with my first horse "Misty", a chestnut Morgan mare, that my husband had purchased for me in 1982 when our son was three years old. She was my childhood dream come true. I was truly blessed to have owned such a wonderful animal and will forever cherish the many happy memories of the times we have shared together. Your first pet always retains that special place in your heart. I know mine have. From my two Morgan horses and each of the seven dogs we have owned, every one of our pets continues to weave a special web through out our lives. The love and bond between humans and animals is very unique. It is especially true between women and horses. That special bond is the reason I choose to paint commissioned pet portraits. My first public showing was a 3’ x 10’ Halloween mural displayed on the wall of my Junior High School. It featured a sketch of Ichabod Crane chased by the headless horseman as depicted in "The Legend of Sleepy Hollow". It wasn’t until 1989 through my husband’s endless encouragement that I finally enrolled in a home study Master Art course. In 1990 I graduated from ICS (International Correspondence School) in Scranton, Pennsylvania and discovered my love for pastels. I have tried many different types of mediums since but still I find that only pastels can truly represent the softness and the beautiful textures of animal fur that I strive for in my portraits. I enjoy working on several different types of pastel supports which lend to their own unique results when combined with various hard and soft pastels but my favorite is still velour and suede board for my soft pastel portraits. For my charcoal drawings I sometimes choose to draw them on a light gray Canson paper while using white charcoal to highlight. Occasionally I will paint a seascape in acrylics and dabble in watercolors, but I always come back to painting animals in pastels. 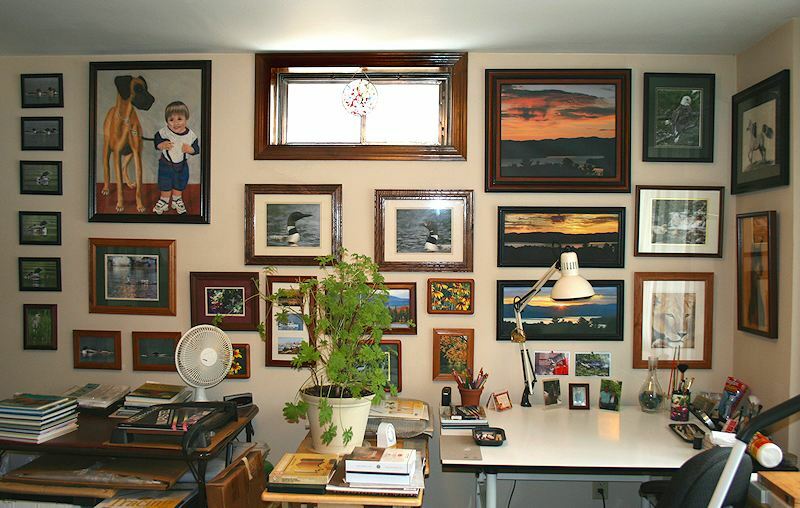 From 1990-1992 I enjoyed showing my artwork in art shows and galleries in Bailey's Island, Bath and the L/A Art show in Auburn, Maine. The L/A Art Show was where I received my first award in 1991 for my pastel of the "Maine Chick a Dee". In 1994 Carville Ceramics asked me to produce 5 pen & ink sketches of Maine wildlife with corresponding animal tracks. The Carville's then reproduced these on ceramic mugs with each animals track wrapped around the back. 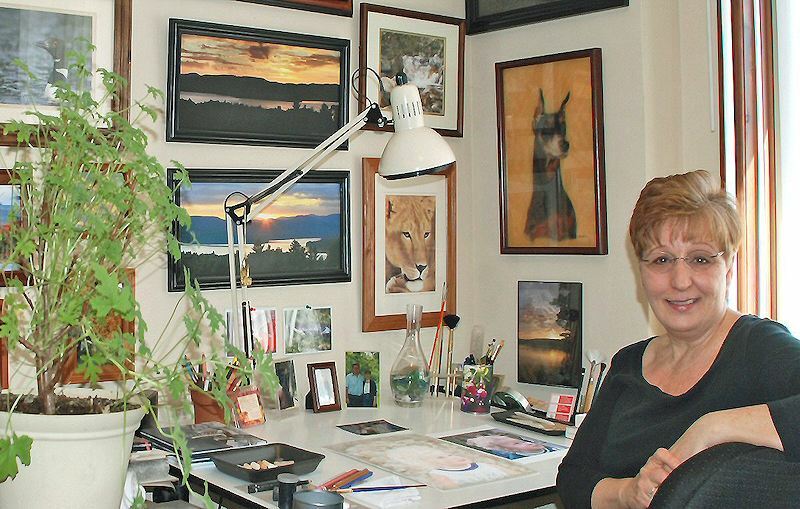 I was surprised and honored to have my Maine Wildlife mugs featured on the front cover of the "Country Samplers" craft magazine in January 1996. Through the magazines exposure and the marketing of the Carville's these mugs have been sold successfully throughout the United States and Europe. I have been painting commissioned pet portraits professionally since 1990 and have enjoyed expanding my creative energies through photography. In 2006 I published my first book titled "Loons of Tacoma Lakes" a pictorial book documenting the raising of a pair of Maine loon chicks here in Central Maine. I have been a member of Pastel Painters of Maine since 2004. And was awarded as a “Honors Edition” member of Who's Who New York registry of Executive and Professional Women in 2006 as an accomplished artist and published author.